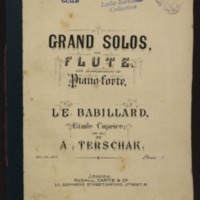 Grand solos for the flute with accompaniment for the piano-forte. Le babillard : etude caprice (op. 23) / by A. Terschak. Includes 2 copies of flute solo part. For flute and orchestra accompaniment arranged for piano.